I Came to ONU Because: I was looking for a Christian school with a strong science program. When I walked on to Olivet's campus, I fell in love. I loved the atmosphere and all the people I met. 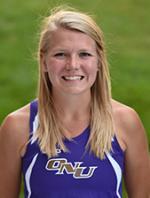 I couldn't wait to call ONU my home. Experience: Prep: IHSA State Runner-up ('12); team co-captain ('12); IHSA Track state qualifier in 4x800m ('12); Upstate 8 Conference All-Conference selection ('11, '12, 13).